LAFAYETTE, Ind. — Two Indiana musicians will provide entertainment at the Lafayette Farmers’ Market this Saturday, June 6th, between 7:30a and noon. 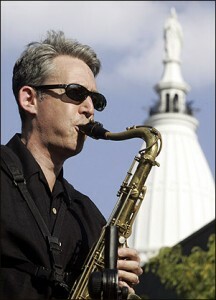 Danny Weiss, a Greater Lafayette-based saxophonist and clarinetist, will be performing from 7:30a–9:00a. Indiana-based New Age musician, Jeff Pearce, will be performing from 10:00a until 12:00p. Danny Weiss leads several groups performing regularly in West Lafayette, Indiana, his home for the past 10 years. He is interested in all forms of music and has performed in many Latin and Caribbean bands (merengue, cumbia, salsa, and ska) as well as Motown (with the Temptations) and Jewish folk music (with Yid Vicious). Jeff Pearce is well known to the ambient/new age music community for his unique approach to the guitar and Chapman Stick. Whether playing intimate acoustic music or crafting deep-space drifts, he composes music which uniquely combines melody and mystery. The Lafayette Farmers Market, managed by the Downtown Development Council of Greater Lafayette Commerce, will be open on Tuesdays and Saturdays from 7:30a–12:30p in Downtown Lafayette on Fifth Street between Main and Columbia Streets. The market will also be open on Thursdays from 3:00p–6:30p from June 4 through August 13 in the Dauch Alumni Center Parking Lot, 403 W. Wood Street on Purdue University campus. On Thursdays, the market will move back to Downtown Lafayette from August 20 through the end of October with hours of 4:00p-7:00p. In addition, the Sagamore West Farmers Market will be in operation on Wednesdays from May 6 through October 28. Information regarding this market can be obtained at www.westlafayette.in.gov/departments/parksandrec/. For more information or to become a vendor at the Lafayette Farmers market, contact Jane Ness at Greater Lafayette Commerce at 765/742-4044.